Since JaiseAnn turned 2 a few people have warned or remarked about the "terrible twos" that are headed my way. Some ask if she's already started. Does she throw fits? Yes. She throws fits when I don't understand what she wants or when she sometimes doesn't get what she wants. Is she moody? Occassionally. No more so than she's always been...yet. Is she mean? No. She doesn't hit or bite. She doesn't steal toys away from other kids really--and she's not mean to us. She doesn't overuse the word, "no" and she doesn't fight with us too much. There are some things that I think are working in our favor--JaiseAnn is talking pretty well which means we can communicate with her pretty well. We compromise with her--she doesn't get her way sometimes and other times I don't get my way. Overall I just think she's a really good kid. Aside from her mostly (now) nonexistant sleep issues (bedtime is still a major source of anxiety for me and she does still wake occasionally but nothing like it used to be) she's a really good kid. We just lucked out. Yet I know that there are probably some trying days in our future. She's cotinuing on a road to independence and I know there are battles to be had. I received some advice/perspective from a mom I very much admired long before I was pregnant. She talked about how she doesn't see age 2--full of fits and tantrums and meltdowns as a "terrible" age. 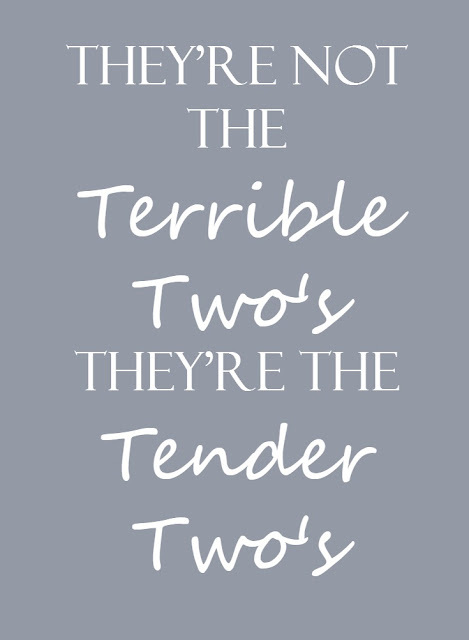 She said, "I prefer to call them the tender two's." While I think there are some people that might roll their eyes at this sentiment it struck a chord with me then--and it certainly fits for my tender-hearted daughter now. She's just figuring out her options, her opinions, and her emotions. She needs to be taught how to deal with those things appropriately and how to voice those feelings appropriately. I'm sure moving from baby to big girl has its moments of uncertainty for her just as much as it does for me. The transition may not be easy--as most never are. While I think there will be days where I will just want a long bath at the end of the day or that I will wish (and likely beg) Zach to put her to bed, I hope that I have more days with the perspective from her point of view. I hope to approach this age with patience and perspective. What are your thoughts on the "terrible two's?"